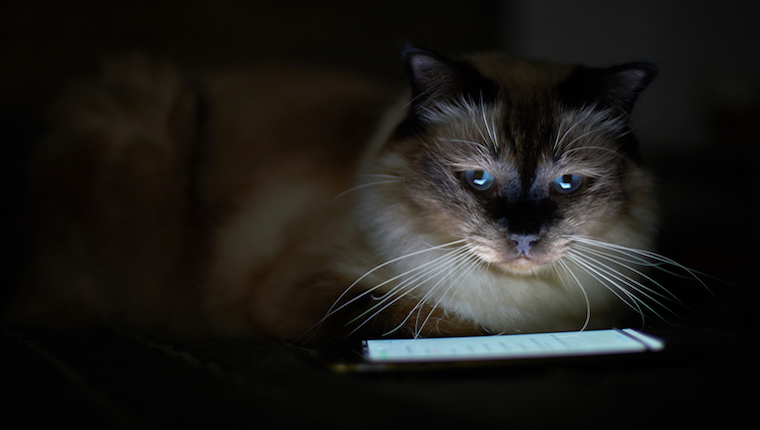 The internet loves cats, so it’s no wonder that Instagram, one of the biggest social media photo sharing sites in the world, has a huge amount of cat-based accounts. That said, you might have to sift through a lot of pics you don’t want before you get to the kitty content that make you happy. Sometimes, you just want an instant laugh. Well, fear not fellow feline fans because I’ve done the digging for you. Follow these five super weird and highly entertaining cat Instagram accounts for daily laughs! There’s a simple-but-genius concept behind the Cats In Food Instagram account. Viewers send in photos of their cats, and then they are “digitally re-purposed” so that the felines are interacting with various foodstuffs. Ever wanted to see your cat’s face atop a cupcake? Your Persian sprawled out over some waffles? Or a Domestic Tabby playing the role of taco cat? Hit up Cats In Food and make it happen. Owl Kitty is a black cat who lives in Portland, Oregon and claims she’s “working hard for my tuna.” This mainly involves turning up unannounced in scenes from various hit movies like Pirates Of The Caribbean, Titanic, and the Harry Potter series. Check out a sample of Owl Kitty’s showreel above! Wilfred Warrior is a brilliantly freaky-looking Chinchilla Persian whose account went viral after the actor Michael Rapaport posted one of his photos. Since then, Wilf’s bugged-out eyes and endearing underbite have continued to charm the Internet on a daily basis. In the mood for some slick photos of a Tuxedo cat who’s been digitally placed in a bunch of wacky scenarios? Head to Princess Cheeto’s account, where you’ll catch this photogenic feline sporting a range of over-the-top hairdos, rocking a spaghetti hat, and even engaging in UFO adventures. Hosico is an internet-famous feline who very much resembles either Garfield or Puss In Boots from Shrek. So when you check out Hosico’s Instagram account, expect lots of footage of this kitty either napping in a bunch of random places or looking guilty and mischievous when caught on camera. Have we missed out your favorite Instagram kitty? Let us know in the comments below!